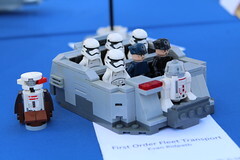 To secure an opportunity to receive a LEGO minifigure giveaway, show attendees should visit the Pavilion Terrace at 12:30 pm each day to enter an instant drawing giveaway, to be fulfilled on the spot while supplies last. One drawing per person per day. 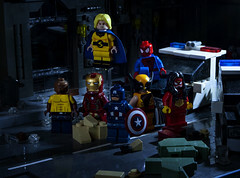 Fans who are not attending SDCC have a chance to win the exclusive LEGO minifigure giveaways and Exclusive Retail Sets via Twitter by following @LEGO_Group and the hashtag #LEGOSDCC. You can also watch a pretty awesome video of the making of the LEGO Movie Batman figure below the fold… though honestly, I want that mini (but still huge) version on the table behind the builders). There are also several pictures of the life-sized and large sized models as well. Scheduled for 2017 availability, LEGO BrickHeadz is a new collectible play experience that allows builders to create, collect and display versions of iconic characters and super heroes out of classic LEGO bricks and elements. To celebrate the new collection, four limited-edition LEGO BrickHeadz sets—each containing two buildable characters inspired by renowned super heroes across movies and comics—will be sold in limited quantity at the LEGO booth for $40 each. Information about LEGO BrickHeadz SDCC exclusive retail sets available below. Before heading to the big screen on February 10, 2017, The LEGO® Batman Movie’s Batman™, Batgirl™ and The Joker™ will share center stage at the LEGO Booth. Together with LEGO Master Builders, attendees can build a large-scale model of Batman on Thursday, followed by Batgirl on Friday and The Joker on Saturday. 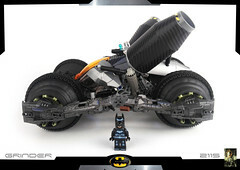 Fans will also get to preview two LEGO building sets, The Batmobile and The Joker™ Notorious Lowrider, inspired by the film, and take a selfie to share via social channels on-site with LEGO Batman using a custom brick-built “Bat Booth.” There will also be talent signing with the cast of The LEGO Batman Movie in the LEGO Booth on Saturday, July 23rd . A life-size version of LEGO Batman made entirely out of 53,998 LEGO bricks will be making a special appearance at the WB booth, #4545. To honor Wonder Woman™’s 75th anniversary and the heroine’s Super Hero’s first solo live-action film slated for 2017, Gal Gadot will make her debut as a life-sized LEGO Wonder Woman model standing 6 feet tall and built from 22,736 LEGO bricks. It took LEGO Master Builders 317 hours to construct the realistic likeness. Three 2017 LEGO® Super Heroes Mighty Micros: DC Comics™ building sets, including Wonder Woman™ vs. Doomsday™, Superman™ vs. Bizarro™ and Batman™ vs. Killer Moth™ will also be on display. A specially produced LEGO BrickHeadz building set consisting of characters Batman™ and The Joker™ will be sold on Thursday, July 21, and a LEGO BrickHeadz building set with Superman™ and Wonder Woman™ will be available for purchase on Saturday, July 23. A LEGO minifigure version of “Ray” Palmer as The Atom, from the popular CW TV series DC’s Legends of Tomorrow, will be given away to lucky winners on Thursday, July 21 and Saturday, July 23. Inspired by the blockbuster film Marvel’s Captain America: Civil War™, a 6-foot tall LEGO model of Captain America™ made entirely out of 25,984 LEGO bricks will stand proud at the LEGO booth. Prior to its January 2017 availability, fans can preview the ultimate Hulk™ mashup in the LEGO MARVEL™ Super Heroes Classic Avengers: Hulk™ vs. Red Hulk™ building set. The fun collectability of LEGO® Super Heroes Mighty Micros is expanding within the MARVEL universe with three new sets on display, including Iron Man vs. Thanos, Spider-Man vs. Scorpion and Wolverine vs. Magneto. Two limited edition LEGO BrickHeadz: MARVEL building sets—each containing two collectible characters composed entirely out of classic LEGO bricks and elements— will be available for purchase exclusively at the LEGO booth. 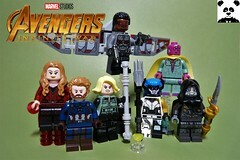 The LEGO BrickHeadz building set containing Black Panther and Doctor Strange will be available for purchase on Friday, July 22, and a LEGO BrickHeadz building set with Captain America and Iron Man will be available on Sunday, July 24. Attendees can enter to win a LEGO minifigure version of Steve Rogers as Captain America on Friday, July 22 and Saturday, July 23. LEGO Star Wars™ fans eagerly awaiting the upcoming film premiere of Rogue One: A Star Wars Story will be thrilled to see an over 6- foot tall life-sized model of the film’s new Death Trooper™, which took LEGO Master Builders 349 hours to build and contains 27,202 LEGO bricks. In celebration of the sixth season of Cartoon Network’s popular NINJAGO™: Masters of Spinjitzu™ and the 2017 feature film, a largescale LEGO model of one of the playtheme’s iconic ninja apprentices, Jay Walker, will be at the LEGO booth. Equipped with his signature Nun chucks of Lightning, the model is made entirely out of 64,148 LEGO bricks and stands 51” high. Fans of the hit Cartoon Network Series Adventure Time™ will get a first-hand look at the official LEGO building set based on a concept from the fan-fueled LEGO Ideas crowdsourcing platform. Available for purchase at $49.99, the set features brick builds of characters Finn the Human, Jake the Dog, Marceline the Vampire Queen, Princess Bubblegum, Ice King, Flame Princess, Beemo, Lady Rainicorn, and Gunter. While purchase and fulfillment of exclusive LEGO BrickHeadz sets will take place in LEGO booth #2829, attendees must first visit the Pavilion Terrace to participate in a random drawing to qualify to buy, beginning as early as 6 am daily. Each of the four exclusive retail sets will be sold on separate days of the show, with a limit of one set per attendee per day. Tickets to purchase must be redeemed on the same day or purchase is forfeited. 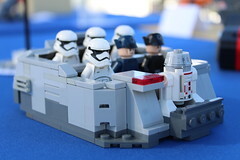 For more news from the LEGO Group, information about our financial performance and responsibility engagement, please visit http://www.LEGO.com/aboutus. 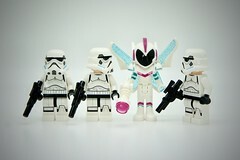 LEGO, the LEGO logo, the Minifigure, NINJAGO and the brick and knob configuration are trademarks of the LEGO Group. © 2016 MARVEL STAR WARS and related properties are trademarks and/or copyrights, in the United States and other countries, of Lucasfilm Ltd. and/or its affiliates.